The exclusivity timer is now up, so PC players can finally get their hands on the first DLC pack for Call of Duty: Infinite Warfare. This pack adds four new maps to multiplayer, including a re-imaging of the classic Afghan map from Modern Warfare 2. 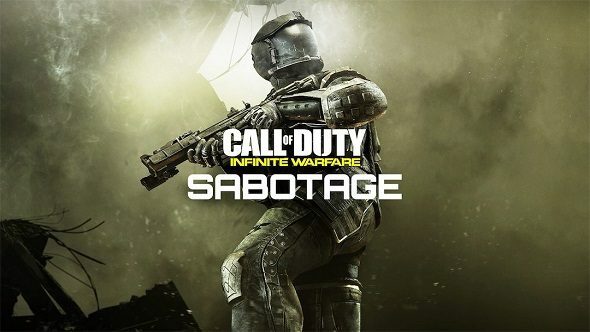 The Sabotage DLC also comes with the ‘Rave in the Redwoods’ chapter for Zombies, giving players the opportunity to blow the heads off zombies covered in neon body paint. For more rootin’ tootin’ shootin’, check out these other PC FPS games. Set in the grimy back alleys of a futuristic Brooklyn, Noir is a three lane map where players have to navigate between cafes, parks and a downtown war zone. Neon is a slightly brighter affair, with fighting taking place in a digitised battle arena where enemies explode into pixels upon death. Renaissance is set in Venice where narrow streets, piazzas and canals make combat a fierce, close quarters affair. Finally, Dominion has Modern Warfare 2’s Afghan map set on Mars, where the crashed airplane has now been replaced with a downed spaceship. Expect people sliding straight through the fuselage to gun down any campers hiding inside. For fans of Zombies, Rave in the Redwoods transports players to the far flung time of the 1990s where the heroes from the previous campaign must escape the traps set by evil film director Willard Wyler. With traps including woodchippers and explosive speakers, you’ll be taking out hordes of zombie ravers while ‘90s techno thumps in the background. Oh, and director Kevin Smith shows up to kill zombies with you. For PC players, you unfortunately cannot buy DLC packs separately so you’ll have to grab the Infinite Warfare season pass should you wish to play through this new content. The season pass costs a whopping $49.99/£39.99, but it comes with all four planned DLC packs, 10 Rare Supply Drops and 1000 extra Salvage Credits to make prototype weapons. I guess that’s the price you pay to party in the Redwoods.